Oof, a card that’s like a reverse of Odric is pretty neat. It has the potential to be an absolute terror. With just 1 other creature it’s a 4/4. I can see this in a midrange deck for standard, and most decks would probably play it in commander. yea same, feels like a odric card except for the fact you need a good amount of creatures to justify its cost of 5 mana. If you have two creatures, one with haste and the other with flying, then you are hitting for six damage in the air the turn this played. That is not a particularly hard condition to meet. If you also have a creature with double strike and one other creature, then you will be doing 20 damage in the air. Much harder to do, but it shouldn’t be easy to do 20 damage in the air. Have you heard of this card called Dark Depths? You mean the card that lets you easily cheat out a 20/20 for minimum effort and mana with good old Thespian Stage and Vampire Hexmage? And do you think they will ever reprint Dark Depths and Thespain Stage/Vampire Hexmage in the same standard rotation? Well, they did manage to let the cat combo go through, but still. There are some very strong high CMC cards in HOU. This thing has a seriously high potential. Just play a bunch of bottom bin garbage which have different abilities on a curve. Hot friggin dang. That’s a creature. Bolas might actually lose between this and the Horse Lord. Well, seeing as this is going in my Marath tokens EDH, it’s definitely going in there. The horse lord doesn’t have indestructible, it gives indestructible to its tokens. sorry edits didn’t go through first time so my correction was delayed, sad panda is sad. When they work out the licensing with Blizzard to have the Gatewatch visit World of Warcraft? But why can’t it be a legendary cat bird snake? This plus Rhonas can be pretty silly. Have a 5/5 and 4/4 both with deathtouch and indestructible. oh you sweet behemoth of a swarm leader. I just wish you were legendary so there would be even more reason to love you. and Feed the Pack with grave recursion. Just noticed the person in the bottom right corner. That is a big bird-snake-kitty. Or maybe that’s just splintered wood. Well, either way. I can’t tell, but it makes that thing looke HUGE. Stupid question, but why isn’t the list of keywords in the description alphabetized? Shouldn’t deathtouch be first? After deathtouch they start to go in alphabetical order? 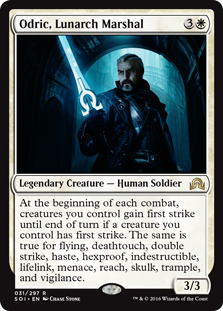 Is First Strike first in the list for flavor? Shhh… MaRo is very sensible about his ABC. Huh. Well what do we have here… I thought it was super duper strict. This randomness seems frivolous to me loll. Is this a cycle of random and good mythic monocolor creatures? If I see one more, Imma start speculating on the other two. Wotc Really needs to give that concerted effort a keyword. But This is a beautiful card. If this is a cycle this would be a great cycle; A group of random creatures that have no true relation. Definately gonna go in my Bant tokens deck when this set comes out. Ok, i REALLY want this. This seems like it has more abilities to choose from your creatures than most. Interesting creature, unfortunately it’s competing with verdant gearhulk at the 5 spot, which is an 8/8 trample on its own and this is a 2/2 gray ogre. If you use Hour of Eternity will it be a 4/4 or not? Yes, because the ability on Hour of Eternity (and the Scarab God) overrides other abilities. How many players are going to assume it has flying by default because of the art? T2 Duskwatch Recruiter, T4 Samut on opponent’s end step thanks to Duskwatch flip, T5 Majestic Myriarch as at least a 6/6 with double strike, haste, and vigilance. This card is great in any deck that can give it double strike because it scales so large.